Nithya and I have been big fans of the Diners, Drive-ins and Dives show hosted by Guy Fieri on the Food Network. We love the fact that it travels the country looking for the small anonymous restaurants that serve great food without emptying your wallet. Update: Check out my new site FamousFood.us to easily find restaurants from Diners, Drive-Ind and Dives and other Food Network shows in a single place. Designed for both PC and mobile (iPhone, Android) use. One day we were wondering if any of the show restaurants were in the Bay Area when I stumbled on this page that lists all the eateries they have visited on the show. Now the list is a good thing to have but is not much use to see an address like “Baker, CA” since I have no idea where that is (near Death Valley). What you ideally want is a map that shows the locations of all the restaurants – that way you can look in your city and see if there are any local places. This is where my inner hacker got interested and I ended up writing this PHP script that downloads the list page and parses the HTML to build a list of the restaurants along with their addresses and any other available information. It then outputs a kml file which opens in Google Earth and shows you a map with each restaurant denoted by an individual pushpin (see screenshot below). Clicking on a pushpin or selecting a restaurant name from the left menu will give you more information such as the address, phone number and any available website. Now that you have been warned, click here and have fun visiting Diners, drive-ins and dives. 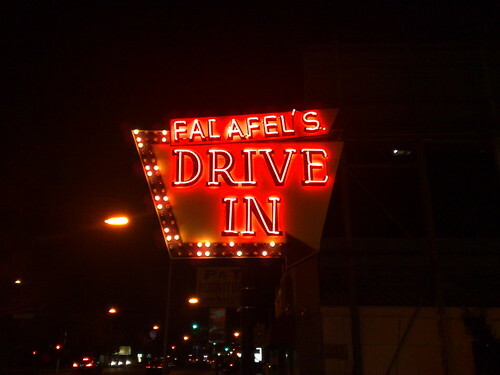 I personally plan on visiting as many of them as I can and started with dinner at the Falafels Drive-In in San Jose last week. Thank you for this! I have hit several places including the Squeeze Inn (Sacramento Ca) , The Pizza palace (Knoxville tn)(Drive up Beer!) and the Russian River Pub. Just a note, the Google Map is off by a few clicks for the Pizza Palace. I plan to use this to hit more places when ever I get the chance. Nice job! I’ll have to investigate what “Sweetie Pie’s” is, as it’s supposedly in the St. Louis area where I live. First, LOVE the tool; thank you! Second, I saw a DDD episode and went to two restaurants in San Diego: Tioli’s Crazy Burger & Luigis Pizza. I see that neither of them are on your map. Any plan on some of the updated locations from last season’s episodes? My wife and I are taking a cross country journey and plan on stopping by as many places as possible. This is definately going to come in handy. Just one thing though, I noticed it stopped at 100 nodes. Not sure if its a code range or if it’s due to the fact that they changed their episode naming convention at episode 307 which is right at the 101 mark. Thanks. how current is this? I am going to be in upper malboro, MD and wanted to see if there was anywhere around there? Awesome, thanks for doing this. 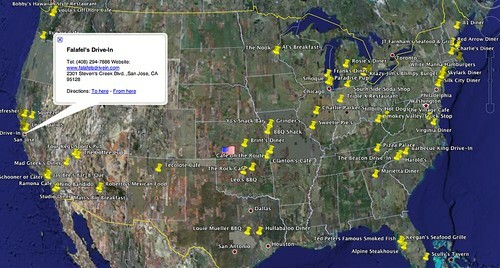 I love to visit as many sites as I can and the Google Earth view of yours is pretty cool. You Rock!!! We have been trying to do this w/o a map. Hodads in San Diego is my new favorite!! I travel the US on my Harley Davidson and we fit in well with diners, drive-ins and dives ! Thank you for making it so much easier to visit all of these wonderful places. I’ve been waiting for an occasion to try out some of his restaurants and now that occasion has arrived! I’m just about to take a trip to Seattle, Baltimore and DC so I can finally eat at some of these diners, drive-ins and dives! Thank you for the script! This is the site I have been waiting my whole life for. Are there any places missing? I thought Guy visited The Penguin in Charlotte, but I couldn’t find it. So far, my wife and I have been to about 40 of the places Guy has visited, and we are planning future trips based on DDD. Seems like Minneapolis has a lot to offer! It appears that they have messed up the list again. I cannot find it on Foodnetwork.com, clicking their link just goes to a search page that is useless. I wish they would get their act together. It looks like it was a temporary glitch on the Food Network website and has been fixed. The list page and the map are both working now. This is a great list and I am going to use it. I have taken the time to watch the triple D show and write down all the names of the resturants. Then I have to look them up. I will tell you this I have been to sixteen triple D’s resturants and loved each one. If you every get to northern California you have to eat at the Squeeze Inn in Sacramento, CA. Just the best Cheese Buger ever. Then we have Joe’s Cable Car in San Francisco!! OMG great food and Joe comes around and jokes with you while you are trying to eat. I can go on about all the other fourteen places but these two were great. I will vist all of them some day. Thank you for this list and Guy thank you for bring us a great list of places to eat. Awesome map! My wife and I like to hit all the triple-D places when traveling.. this map helps us find those near where we are going! Thanks! Great job. I hit “Hillbilly HotDogs” near Huntington WVa. I never would have done the research on my own. For the record. I did not order a “Home Wrecker”. Would like the DDD list in regular Google maps like your Throwdown & Best Thing versions as apposed to the Google Earth version. Would love to check this out, but the link only opens up 1 place. Have you had a chance to update it? Thanks for letting me know about the map – I have now fixed it so that all 337 restaurants are available. Plus as a bonus I have also improved the load time to be instantaneous.